Naples Sandpiper Bay Club Condos: Motivated Sellers! Bring your offer! This charming condo in Naples Sandpiper Bay Club will definitely fit your needs whether you call Naples, FL your permanent home, come for vacation or looking for the investment opportunity. Updated with newer stainless steel appliances, granite, wood flooring, hurricane and plantation shutters plus additional plexiglass sliders on the lanai to keep it clean and dry. Two community pools and landscaping are in process of being upgraded, special assessment paid. Security cameras installed at both entries and new roofs throughout. Onsite property management. Boat docks available for lease or purchase. 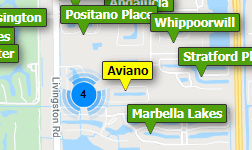 Waking distance to the 5the Ave, Tin City, Bayfront, Naples Bay Resort shopping and dining. Enjoy what Olde Naples has to offer plus the gulf access at a fraction of the price and with low HOA fees. Naples Sandpiper Bay Club Condos: This Ultra-Contemporary ‘Pet Friendly’ condo is close to town and would be perfect for someone looking for a “Turnkey Furnished” and tastefully redone, first floor, modern apartment with privacy and convenience. Two nice size bedrooms, an over-sized laundry room with tons of storage, a peaceful screened lanai overlooking a preserve, and so much more! Some of the many upgrades include new Bahama shutters, new impact sliders, extended cabinetry in the dining area, and a brand new full-size stack washer & dryer! You are a short walk to the community pool and a bike ride to downtown Naples! Look no further, this is your Naples Get-away home! Naples Sandpiper Bay Club Condos: JUST REDUCED! Just completed rehab and is the largest floor plan available (larger living/dining room and expanded lanai.) MUST SEE!!!!! New appliances, AC, water heater, tile, granite countertop, cabinets, bathrooms, light fixtures, crown molding, baseboard. The community has expanded the west pool area and added new landscaping, street lights and new landscaping for each building. New roofs installed in 2018. Private but close to the best Naples has to offer: beach, 5th Avenue, dining, shopping. On site boat docks available from unit owners when they are available. VACANT AND EASY TO SHOW. NO APPOINTMENT NECESSARY. Naples Sandpiper Bay Club Condos: PRICE JUST REDUCED!! !Beautiful, updated and tastefully decorated, turnkey furnished two bedroom and two full bath condo! The updates include: New AC, new hot water heater, tiled lanai with storm shutters, newer kitchen appliances, granite counters in kitchen and both bathrooms, tiled lanai with new screening, new baseboard, new carpet in both bedrooms, tile on the diagonal throughout the living area, custom plantation shutters on the windows and lanai sliding doors, and the popcorn ceiling was removed and textured, and the condo interior was re-painted. This is an end unit with an extra window in each bedroom;adding more light to this already bright unit. It is in "move-in" ready condition!!! Sellers have paid the special assessments! NEW ROOF! It has two heated pools, newly renovated restrooms, newer deck furniture, newer gas BBQ grills and the Clubhouse has had some updates. The Naples Sandpiper Bay Club is located close to all Naples has to offer; one of Naples best kept secrets. The community is close to Royal Harbor, Naples Bay Resort, Bonefish Grill, Tin City, Bayfront and 5th Ave. restaurants, shops and Naples Beach. Don’t miss this opportunity;move in and enjoy NAPLES!!! Naples Sandpiper Bay Club Condos: Nestled among the Pines & Palms is Sandpiper Bay Club. A cozy 2 bedroom 2 bath condo, this home is a perfect hideaway just a short distance from all the Sun, Fun, Shopping, & Dining Naples has to offer. Located on the first floor right near one of the two community pools. Boasting Plantation Shutters throughout as well as Hurricane Impact Resistant Windows, Stainless Steel appliances in the kitchen, Front Loading washer & dryer, and a new A/C system installed in 2017. The enclosed lanai creates a comfortable Florida Room for enjoying the beautiful sunshine whilst still keeping your cool. Naples Sandpiper Bay Club Condos: GREAT LOCATION! GREAT COMMUNITY! GREAT CONDOMINIUM! This top floor, end unit, recently had all the popcorn ceiling removed and replaced with a textured surface. The entire interior has been repainted. Newer wood floor in the living and dining area. This condo awaits its new Owners’ personal touch and tailored improvements. This condo is located in the beautiful and meticulously cared for community of Naples Sandpiper Bay Club, one of Naples’ hidden gems. The low fees include basic cable and internet. The community is near Royal Harbor and close to the shops and restaurants at the Naples Bay Resort, Tin City, Bay Front and Old Naples. Only a short car ride to Naples beaches. Priced for quick sale! Naples Sandpiper Bay Club Condos: C.15704 ________DOWNTOWN NAPLES BUY___CLOSE TO THE RIVER, TIN CITY AND MORE___FURNISHED CONDO WITH WOOD AND TILE FLOORS___JUST STEPS TO THE CLUB HOUSE, POOLS AND MORE.__JUST MINUTES TO 5TH AVENUE AND THOSE "WHITE SUGAR SAND" GULF BEACHES.___ONE LOOK AND YOU'LL FALL IN LOVE.___DON'T FORGET TO BRING YOUR CHECKBOOK! Naples Sandpiper Bay Club Condos: Located less than two miles from all that Olde Naples has to offer. The sugar sand beaches on the Gulf, shopping on 5th Avenue and 3rd Street and the finest eateries in all of Naples. Sandpiper Bay Club offers boat slips(when available) to purchase or rent. The boat canal is located along Haldeman Creek only few minutes from Naples Bay. The community has two heated swimming pools, clubhouse and BBQ grills for residents use. The condo is in excellent condition featuring stainless steel appliances, quality white cabinetry and electric shutters on the lanai. The property is offered furnished for your convenience allowing you to walk in and begin enjoying the Sandpiper Bay Club lifestyle! The condominium fees and taxes are very reasonable. The generous rental policy allows investors to generate rental income. You can enjoy all that Naples offers as an owner in this wonderful community. SELLER SAYS"BRING OFFERS". Please click on photos for BEST VIEW. Naples Sandpiper Bay Club Condos: C.15640 This charming turn-key furnished condo is tastefully appointed with newer appliances,cabinetry & granite. The Seller is offering a $7500 credit toward updating the flooring. Enjoy the 3rd floor location overlooking the main pool. You cannot duplicate this close-in location to 5th Ave. So. fine dining, boutique shopping and Old Naples beach access for the money. Naples Sandpiper Bay Club is now better than ever!Pools & landscaping are in process of being upgraded. Security cameras installed at both entries & new roofs throughout. Onsite management is in place to better serve you. Don’t forget...the Sunsets are Free! Naples Sandpiper Bay Club Condos: Top Floor with soaring Cathedral Ceilings. No worries about the stairs, there is assigned parking only a few steps to the elevator. End Unit with no Shared Walls so it's quiet and Private. Bright and Open Condo is ready for an immediate occupant. South Eastern View overlooks a wooded area and the condo is very close to the adjacent Canal and Boat Docs. White beadboard kitchen cabinets and matching Stainless Steel Frigidaire appliances. Top quality Washer and Dryer in Large Laundry Room. A/C Brand New in 2018. Owner's manual for all appliances, hot water heater, and A/C in an easy to view binder. Large Walk-in Closet in Master Bedroom. Waterfront/Boating Condo Community with 2 Community Pools and Boat Docks for Rent or Purchase when available. New landscaping in progress. New Roofs installed in 2018 and all assessments are paid by current owners. Short Notice Showing are OK. Naples Sandpiper Bay is near Royal Harbor and only 5 minutes from downtown Naples and the beaches. Naples Sandpiper Bay Club Condos: The perfect South Naples winter retreat! Turnkey furnished 2 bedroom 2 bath end unit condo is an adorable 2nd floor residence (and this building has an elevator) comes with tile flooring throughout all living areas & newer stainless steel appliances in the kitchen. Enjoy peaceful and private preserve views off the screen-enclosed patio ... this screened patio faces Southwest and is equipped with electric storm shutters. The air-conditioning system was recently replaced, just 3 years old. The parking space #109 for this residence is located directly outside your front door and there is ample guest parking. Naples Sandpiper Club is a friendly, quiet community with 2 heated community pools, a clubhouse and as much social activity as you feel like. Boat docks are subject to availability for lease or purchase. Easy gulf access with NO BRIDGES. Just 5 minutes to world-famous Fifth Ave South restaurants and art galleries, our beautiful beaches, Naples Pier, Tin City, Bayfront restaurants and Naples Bay Resort. Great investment opportunity, as the Condo Association allows 12 leases per year with a 30 day lease minimum. Paradise is affordable .... come see today! Naples Sandpiper Bay Club Condos: Location Location Location!! Gorgeous, complete remodel, 2 bedroom 2 bath condo in the popular Sandpiper Bay Club! Walk or Bike to 5th Avenue, Olde Naples and the Beautiful Sand Beaches! Gorgeous Kitchen with Granite Countertops, Stainless Steel Appliances, Stunning Backsplash and High End Cabinets! The Cabinets and Granite carry over to the Guest and Master Bathroom! Hurry, this will not last! Need professional assistance selling your property at Naples Sandpiper Bay Club Naples? Find out how an Area Specialist can help to generate more property exposure in order to get the most money for your investment in the least amount of time.